I became interested in the supernatural at about age 7. My brother and I fooled with ouija boards, later we conducted seances, and once we even tried to conjure up the devil in an old convent graveyard at midnight. While our activities almost always produced discernable results, they lacked the material proof we really wanted to substantiate our experiences. Finally, as teenagers, we sought to procure that proof. 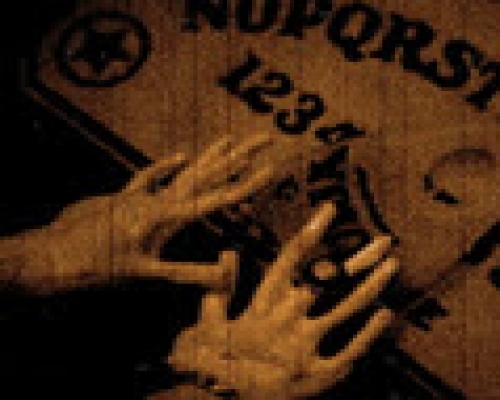 We gathered several friends together in a quite room for the purpose of conducting a seance. At one end of the room we placed a tape recorder. The participants sat around a circular table, in the center on which burned a single candle. The chairs, the individuals were connected by a web of threads, to provide evidence of individual cheating.The lights were dimmed, the group held hands; we centered our attention on the flame of the candle, and willed the manifestation of a paranormal presence. At first, there was silence. I felt a cold breeze over my feet. The tension in the room increased enormously, but nothing happened. We ended the seance, and our friends went home. Though my brother and I were sorely disappointed by the lack of results, we decided we would listen to the tape, if for nothing else than formalities sake. What we heard was chilling. A short while after everyone joined hands and settled down, there was a profound change in background noise. I can best describe it as the sound of rushing water. Then, coming from some point in the room and going towards (and up to) the tape recorder, were what sounded like the footsteps of someone who was limping. When they reached the tape-recorder, there came the sound of a bell ringing. The footsteps receded, the bell sounded again, the sound of rushing water stopped, and, on the tape were our voices; the seance ended. No one consciously experienced anything that was recorded on that tape. We were there, and whatever anyone else might say, we were there. It scared the hell out of us, and thirty years later, it still chills me. Since then, I have never actively perused contacting spirits.